Aiyana Johnson was recognized by the USJF Academic Honors Society Committee for the 2013-2014 Academic Year. Recipients of this award must be a member of USJF for the entire year and achieve a GPA of 3.7 or higher (based on a 4.0 GPA system with no rounding up). Aiyana also competes regularly all over California and does well in her competitions putting forth her best efforts in them. “The aim of judo is to utilize physical and mental strength most effectively. Its training is to understand the true meaning of life through the mental and physical training of attack and defense. You must develop yourself as a person and become a useful citizen to society.” – Dr Jigoro Kano. Aiyana is an example of the principles that Dr. Jigoro Kano was trying to instill in judo. He believed that a good practitioner of judo must not just study the techniques of judo but also strive to be a good person. Aspects of this included doing well in school and being a good citizen. Sei ryoku zen yo is a phrase used in judo to describe one’s use of mental and physical abilities to accomplish worthwhile goals efficiently.Through the study of judo, one can not only learn how to apply the physical aspects of the art to be skilled in fighting, but can also teach the student how to apply experience, maintain composure, and make decisions clearly to contribute to a better society. 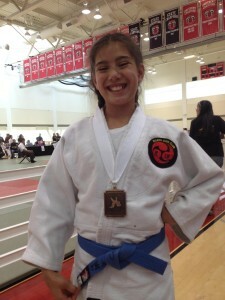 Aiyana and her family joined DeLeon Judo club a year ago. Although they live in the Reno, NV area, the family makes regular trips to practice with the club.